Recent conversation on Twitter and a great post today at Sports Locker got me thinking about the ever evolving world we live in, our Hobby passions, technology and how they relate. With the near extinction of brick and mortar hobby shops, collectors have needed to turn elsewhere to find their connection points with other like-minded individuals in the pursuit of trades, information, commentary, mindless bantering and playful trash-talking. All of these used to be staples at my local hobby shop until they closed their doors a few years ago. Facebook, Twitter, blogs, forums, and message boards have provided an outlet for these connections and while nothing will truly replace face-to-face interaction, I can honestly say that I have made more meaningful connections since embracing the online collecting community than I did in years of frequenting my local hobby retailer. Since utilizing Twitter, I have changed my opinion of its function as a true social networking tool. Intitially, as a blogger, I realized it was a viable broadcasting tool and also a convenient way to aggregate web content of interest to me. However, in the last few months, I have engaged in many real-time conversations, with a 2-way exchange of dialogue you can't necessarily get elsewhere. For me, the culmination of social networking via the blogsphere came at The National in Cleveland in early July where I was able to meet and connect with Dave of Fielder's Choice and James of Sports Locker. In addition, I recently met Steve of White Sox Cards at a local ESPN event. These meetings, in all likelihood, would not have been made were it not for the blogsphere and Twitter. Steve of the now retired Sports Card File, Chris of Freedom Cardboard, Mario of Wax Heaven, and Adam of Sports Cards Uncensored, and myself recently had a very lively exchange of thoughts and dialogue related to the nature of social networking and some of the inherent negative coverage online commentary seems to focus on at times, related to The Hobby. Where am I going with all of this? I don't know really. I guess the idea of an eventual App on my Blackberry about the hobby I love got me thinking about how different the hobby landscape is now that technology has become such a huge part of it. If you transplanted yourself back in time, to say 1972, would you even know HOW to collect? 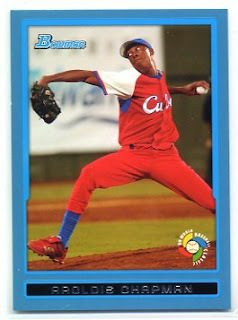 If you play for the Cuban National Team and throw a 100+ mph heater, MLB GM's take notice. It seems every couple of years a young phenom matching that description manages to escape the oppressive regime in Cuba for a chance to play in the Bigs. Defecting today isn't like it was at the height of the Cold War, however, the word, and act, still carries significant meaning and despite our freedom here in the States, it's easy to forget the hardship many people endure to come here for a chance to realize their dreams. Aroldis Chapman has been designated by MLB as a unrestricted free agents and the Angels, Yankees, Red Sox have all expressed an interest in the flame thrower. His bio in Wikepedi shows a resolute a determined spirt who has been called "one of the worl'd 3 best pitchers not in the majors." Chapman failed at an attempt to defect in the spring of 2008. 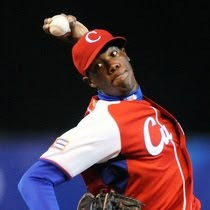 Following the defection attempt, he was brought to Havana to meet with Cuban President Raul Castro, who gave him a conditional reprieve, suspending him for the remainder of the National Series season and also keeping him off Cuba's national team for the Beijing Olympics, but allowing him to return to the National Series and play in the World Baseball Classic. Chapman remained determined to defect, waiting for the best moment to arrive. He successfully defected from Cuba while in Rotterdam, Netherlands, where the Cuban national team was participating in the World Port Tournament on July 1, 2009, by walking out the front door of the team hotel and getting into a car driven by an acquaintance. C hapman already has several rookie cards on the market, all from Topps including Bowman and Bowman Chrome. You can find a complete list of current offereings on eBay, here. After enduring what has been a brutal last 6-weeks of baseball in Chicago, and with no compelling division races to tune in to nationally, I am SO ready for MLB Playoffs to start. Couple that with the NFL season being in full swing and some highly touted rookies performing above expectation (Percy Harvin, Mark Sanchez immediatly come to mind) and tht NFC North proving to be a nail-biter all year, with the Vikings, Bears, and Packers, all jockeying for supremacy, and the 2009-10 campaign is shaping up to be great. 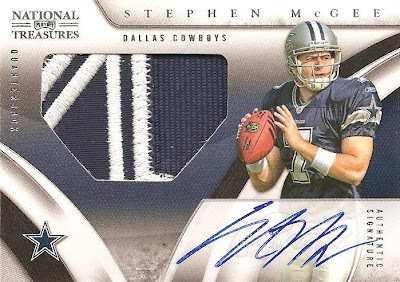 (3) Game-Used Memorabilia Cards and (1) Autographed card per box (on average)! For those of you that can't wait, you can pick up Victory of Fleer Ultra. I actually like the Fleer Ultra brand and would like to Upper Deck utilize this for baseball. 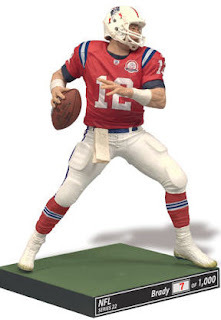 As for the Series 1 flagship release, November 10th is the date to get your hands on one of the Hobby's most coveted RC lineups int he form of Young Guns. 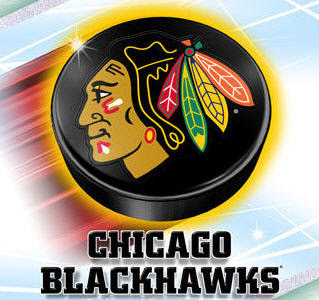 I am really hoping the young Blackhawks can capitalize on the moment from last year and their playoff series wins. However, I do believe they are going to miss Marty Havlat more than they realize. As Scotty Bowman and company lead the organization for the first full season, hopes and expectations are high.